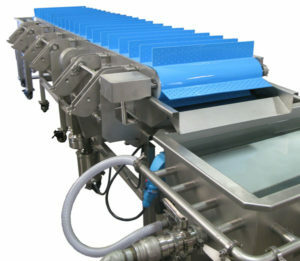 NSEP metered treatment tanks are designed to submerge the product in an anti-browning solution for a specific time. The upper metering conveyor is controlled on by an A/C inverter, which allows the operator to set a specific time. 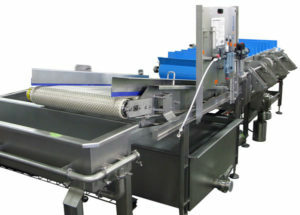 The metering conveyor is hinged, so that it can be easily raised for cleaning. The tank is designed to utilize a minimum amount of water to conserve the anti-browning solution.